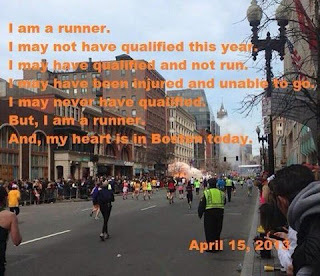 As a runner, a marathoner, I am in shock over what happened at Boston. The running community is close and tight knit, whether you are an elite runner, a Boston qualifier, a back of the packer, or just starting out. This is why I feel personally affected by this event. I feel like my family has been attacked. However, runners are resilient (really, we run marathons and half marathons for fun). We will still run and we will continue to encourage, inspire and uplift others. So today, on my run, I will run for more than myself. I will run for Boston.